High temperatures today reached around 50 degrees, helped by sunshine and a breeze out of the northwest that proved to be advantageous because it is a land breeze, not coming off of Lake Huron. Three disturbances are showing up on the satellite and radar imagery between the Midwest and the West Coast and two of them are very weak. One to our north will provide showers to the Upper Peninsula tonight-early tomorrow. One to our south will bring a few showers tomorrow to Mid-Michigan and parts of Northeast Michigan, but mainly south of Alpena. 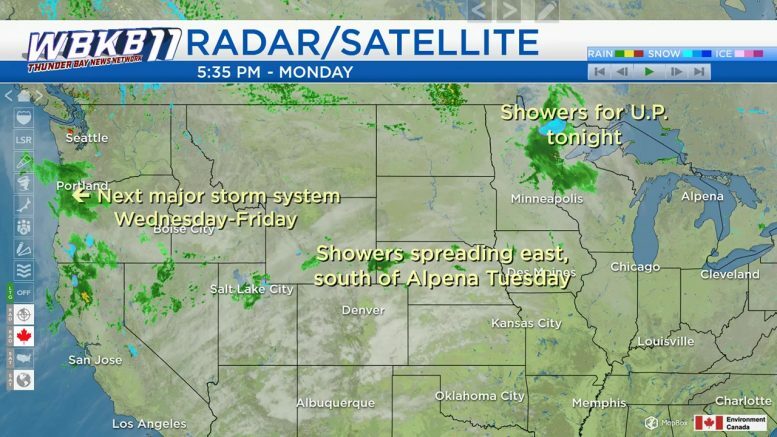 A larger storm system just arriving onto the West Coast will travel across the Plains then slow as it reaches the Great Lakes. This storm system will give us widespread rounds of rain from Wednesday through Friday. Overnight lows will drop to the upper 20s with only a few clouds and light winds. High temperatures will reach the middle 40s tomorrow afternoon with mainly cloudy skies and the possibility of a few showers. 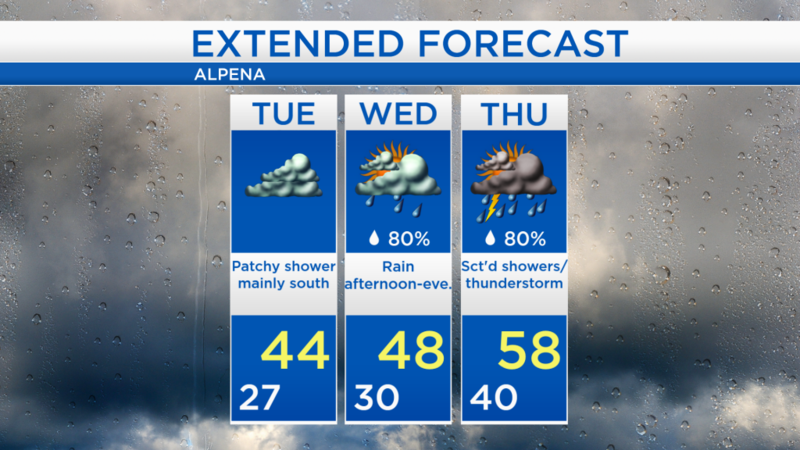 The chance of showers tomorrow is a little higher south of Alpena, lower to the north, and any resulting rainfall amounts will be very light. In fact, much of tomorrow will likely end up dry especially north of Harrisville. Wednesday should start dry, but rain becomes likely in the afternoon and evening. Wednesday and Thursday will provide a widespread soaking to Northeast Michigan. A few thunderstorms are possible Thursday (as early as the predawn hours). Scattered showers are expected for Friday as well. Much of tomorrow should end up dry despite a possible chance of showers. Temperatures will reach highs in the upper 40s on Wednesday, then rain will enter our area. Limited dry breaks are possible Thursday morning, then again Thursday night. Overall, Thursday is looking wet with a chance of thunderstorms. Winds out of the south will push temperatures into the upper 50s on Thursday. For the rest of Northeast Michigan’s weather forecast, watch the latest weather video by clicking the weather tab at the top of the page.